← Meet the Robot Makers! Click on the image to download a copy of the Gulf Coast MakerCon Educators Guide. The “maker” movement is simply the DIY creative spirit reignited for the 21st century. It’s a return to self-sufficiency, self-reliance and creativity, providing engaging and hands-on opportunities to inspire, educate, and entertain curious and creative learners of all ages. It celebrates arts, crafts, engineering, food, green design, music, science and technology and brings together communities who embrace the DIY (do-it-yourself) spirit. There are lots of ways to “make” education happen in this very active learning experience, and to engage students in active learning at Gulf Coast MakerCon. 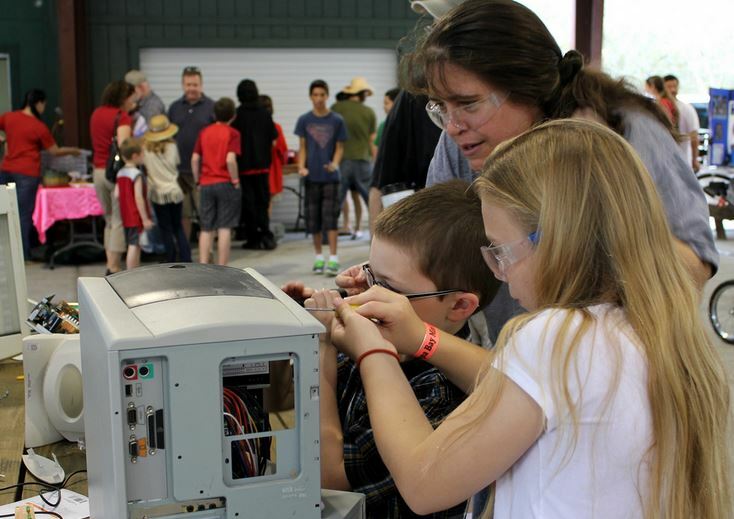 We’ve compiled some resources for educators interested in visiting Gulf Coast MakerCon with their students, or just looking for classroom take-aways. The weekend will be rich with hands on learning opportunities for all ages, and will hopefully inspire some ideas for classroom enrichment in the process. Meet and interact with all our Makers, who are sharing their unique passions and projects. Explore the wide variety of exhibits and presentations that will be available throughout the weekend. Experience a live performance or demonstration. Engage in a hands-on project or activity that you can take home. Collaborate on a project or share experiences with people of all ages. Learn about the power of the Maker community. Be inspired, as a student or member of the public, to try at least one new idea at home or at school. Be inspired, as a teacher, to bring at least one new idea for active making into the classroom. Get a sense of the wonder and value of following your passion! Inspire Curiosity in the world around you! If you’re a public school teacher in Hillsborough, Pinellas, Pasco, or Polk county and would like to bring groups of ten or more students to Gulf Coast MakerCon, please drop us a line at info@learningis4everyone.org so we can provide you with a classroom rate, and help maximize the educational impact of your visit. This entry was posted in DIY, Education, Gulf Coast Makers Festival, MakerCon, Makers Festival, Young Makers and tagged education, educational fairs, Gulf Coast MakerCon, Gulf Coast MakerCon Educator Guide, Gulf Coast Makers Festival, makers festival. Bookmark the permalink.